The Hon-line (Nankai Electric Railway Co., Ltd.) from Namba to Wakayamashi as Limited Express with the class 7100 train, Express with the class 1000 or class 7000 trains, or as local with class 7100 train. Also Airport Express from Namba to Kansai airport, using a part of the Hon line and then the Kuko line, for the class 1000 train. The gauge is 1067 mm and the lines are electrified (1500 V DC). No landscape details outside the railroad. Line map over railroads and subway in the Osaka area (Acrobat document). For all route alternatives follow the Hon line (main line, blue-green at the map) southwards from Namba via Kishinosato Tamade, Hagoromo, Kaizuka and then westwards to Izumisai. The alternatives to Wakayamashi continues at the Hon line (main line, blue-green at the map) from Izumisai southwest via Misaki-koen towards Wakayamashi. The alternatives to Kansai airport continues at the Kuko line (airport line, blue-green at the map) straight north from Izumisai to the Kansai airport. 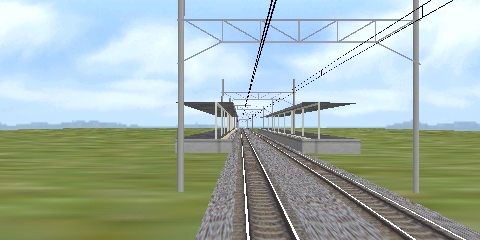 Stations at the Nankai railway's lines. The main line is called Hon . Click at Map by a station name to show a map over the station and its closest surroundings. The creator's web site has long ago disappeared from the Internet.